The city of Toledo has contracted with Gerken Paving Inc. to resurface Douglas Road from Dorr Street to Kenwood Boulevard. Beginning around Monday, May 5, the curb lanes of Douglas Road will be closed for milling and paving. The projected completion date for the resurfacing is mid-July. Since 2007, Project SEARCH at The University of Toledo has helped dozens of individuals with disabilities get work experience through internships. 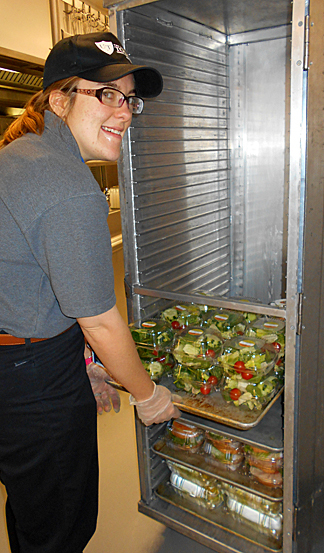 Trinity, a Project SEARCH student, helps prepare food for restaurants on Main Campus and works for Aramark. The program brings high school seniors from Penta Career Center in Perrysburg to UT to complete three internships on Main and Health Science campuses. Many of the internships involve custodial work, warehousing, food services and more. Daniel, a student in the program, works with Environmental Services and Food and Nutritional Services on Health Science Campus. “I’m hoping to get a job in the real world,” he said. Trinity, another Project SEARCH student, works with Aramark on Main Campus to help prepare food at the restaurants. Justin works with the Outpatient Rehabilitation Center making beds, readying rooms before patients come in. He wants to get a job doing this in a nursing home when he graduates. “I like working with the patients and the doctors and nurses,” he said. Ragen works in the residence halls as well as Gillham Hall, helping to clean. During her last rotation, she helped care for linens at UTMC. “I’ve really enjoyed my internships,” she said. She recently applied to work at McDonald’s. Project SEARCH began in 1996 as Students Exploring Alternative Resources at Children’s Hospital at Cincinnati Children’s Hospital Medical Center. Since then, it has grown to include programs like the one at UT in settings across the country and around the world. The program has many goals for the students. They pick up skills like talking to their boss, taking initiative in their work instead of being told, and making sure they finish jobs in a timely fashion. And the program also teaches them how to feel comfortable in an interview setting. On Thursday, May 22, at 11 a.m., a ceremony will be held at Penta Career Center in the Frederick L. Susor Auditorium to celebrate the senior Project SEARCH interns. For more information on Project SEARCH at UT, contact Williams at 419.260.0070. In conjunction with the UT sustainability, energy, efficiency and design initiative, the sustainability engineering class offered by the Civil Engineering Department will present a climate action and cost reduction plan for the University Tuesday, April 29, at 4 p.m. The students’ presentation will take place in Nitschke Hall Room 1027. The University of Toledo annually spends $21 million for its campus operations, including the purchasing of natural gas, diesel, electricity, paper, fertilizer and management of its wastewater and solid waste, according to students in the class. Approximately 173,000 metric tons of greenhouse gases are directly or indirectly emitted from these operations. The climate action and cost reduction plan is designed to reduce UT’s emissions by 40 percent by 2040 and decrease the University’s annual operating expense by $1 million. Light refreshments will follow the presentation. To RSVP for the free, public event, contact julie.perry@utoledo.edu. They’re always there to help, ready to share a smile and lend an ear. UT Medical Center has some 340 volunteers who put in an average of 3,000 service hours a month in more than 100 departments. 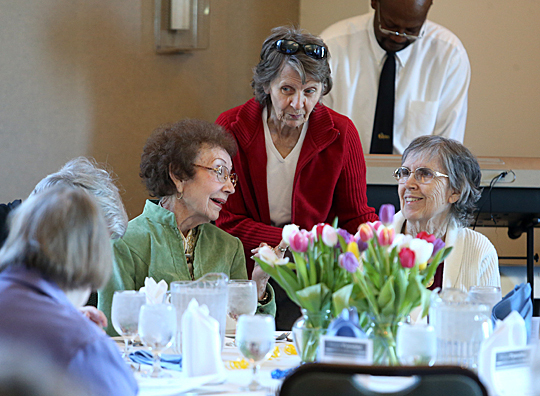 Satellites Auxiliary members and MCO retirees Jean Brenner, left, Rose Tammerine, center, and Carolyn Stone chatted at the luncheon held during National Volunteer Week. “We want to thank and celebrate these individuals who make such a big difference in the lives of so many,” said Amy Finkbeiner, UT service excellence operations manager. About 75 volunteers attended a recent luncheon held in their honor during National Volunteer Week. “Our UTMC volunteers have provided 47,424 volunteer hours during the past year,” Diane Ammons, assistant to the vice president for medical affairs, said at the event. “Our volunteers have and continue to demonstrate their collective allegiance by making a difference. They continue to demonstrate determination and desire to meet our daily challenges and to accomplish our goals — and we thank them,” added Ammons, who spoke on behalf of Dr. Carl Sirio, vice president for medical affairs and associate dean of clinical affairs in the College of Medicine and Life Sciences, and chief medical information officer, who was unable to attend the luncheon. Finkbeiner said volunteers are an integral component of the hospital as they provide an extra dimension of care and service to patients, understand and empathize with families and visitors, provide support services for hospital and University staff, and offer research assistance in laboratories and University facilities. “Our volunteers help us improve the human condition one person at a time at UT Medical Center,” Finkbeiner said. • Theresa Wisniewski — 1,049. The Satellites Auxiliary consists of non-dues-paying volunteers who provide support for patient programs in accordance with the needs and approval of hospital administration, as well as conduct fundraising events and community outreach, and help staff the gift shop. “Our Satellites Auxiliary volunteers are an amazing group of community men and women willing to give dedicated service to improve the human condition of our patients, their families and our employees,” Satellites President Lynn Brand said. Anyone interested in becoming involved with the auxiliary may contact Brand at 419.385.6700. Volunteers must be 18 years or older. For information on the UTMC Volunteer Services Program, contact Finkbeiner at amy.finkbeiner@utoledo.edu or 419.383.6336 or Patty MacAllister, support services coordinator, at Patricia.Mac2@utoledo.edu or 419.383.3206. The Office of Residence Life is recruiting faculty and staff as volunteers to assist the move-in process next fall. First-Year Resident Orientation Guides, or FROGs, help resident assistants and hall staff with the move-in process in August. FROGs help residents move their belongings in, talk with parents and families about UT, and welcome new students and their families to campus. Volunteers are encouraged to sign up here. For more information about the program or to sign up, contact Matthew Perry in the Office of Residence Life at 419.530.4972 or matthew.perry@utoledo.edu. Theatre Lecturer T.J. Gerckens received the 2013 Equity Jeff Award for Outstanding Lighting Design — Large Theatre for his work in “Metamorphoses” at the Lookingglass Theatre in Chicago last fall. Gerckens is no stranger to the Jeff Award spotlight. 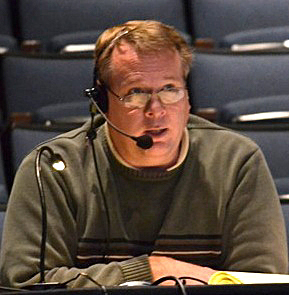 He has been nominated for five Jeff Awards and has won two, including one for the original production of “Metamorphoses” in 1999. The Lookingglass production of “Metamorphoses” was directed by its Tony Award-winning playwright Mary Zimmerman, who received the MacArthur Foundation Genius Award. It is based on the works of the Roman poet Ovid and retells his ancient stories of love, loss and transformation in the setting of a large pool of water, juxtaposing the ancient and the contemporary. The show has been on and off Broadway and toured internationally in Australia. Coincidentally, The University of Toledo Department of Theatre and Film put on a production of “Metamorphoses” last year, but Gerckens was unable to help with the lighting because he was working in San Francisco. Gerckens, who joined UT in September 2012, will be back in Chicago in May working on the lighting for a production of “The White Snake” at the Goodman Theatre. The Jeff Awards are committed to celebrating the vitality of Chicago-area theater by recognizing excellence through its recommendations, awards and honors. The Jeff Awards foster the artistic growth of area theaters and artists, and promotes educational opportunities, audience appreciation and civic pride in the achievements of the theater community. Jordan Gannon’s more than a quarter million dollars in sales during a three-month internship with 3M led to a full-time job upon graduation with the global innovation company. Gannon, who will receive his bachelor’s degree in business administration in marketing and professional sales from the UT College of Business and Innovation Saturday, May 3, will join the company as a sales representative in its Building & Commercial Services Division. During summer 2013, Gannon was a sales intern based in Kentucky, where he built and maintained relationships with more than 100 nursing homes and hospitals. During his three months with the company, he earned $290,000 in sales for 3M, which is more than nine times the average intern goal of $30,000. Gannon said 3M only recruits for their frontline sales program at a dozen or so schools across the country, and his introduction to the company only came because of the great reputation of the UT business college and its professional sales program. Gannon credited the college’s job fairs, mock interviews, networking nights and other programs that helped him hone his professional business tools that went into getting his job. He also had outside the classroom leadership experience with the Alpha Kappa Psi professional co-ed business fraternity, which included serving as president. Gannon is the third member of his family to join the Rocket Nation. Both of his parents are business professionals and alumni of UT, which led to his decision to come to Toledo despite growing up in Newark, Del. His advice for other students searching for jobs after college? It’s not what you know, but who you know. 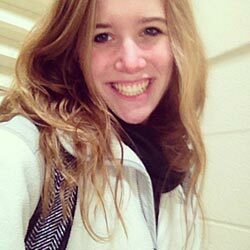 A University of Toledo student is among five finalists in a global United Nations Environmental Program video-blog contest. Kaitlyn Randolph, a third-year secondary science education major, was selected by a jury of the United Nations as one of the finalists. She is a student in the Jesup W. Scott Honors College. As part of World Environment Day, which will take place June 5, amateur videographers submitted videos in order to raise awareness of the changing environment. Randolph’s video explains the dangers of rising sea levels and increased greenhouse gasses as a result of human activity. Don Cheadle, award-winning actor-director and United Nations Environmental Program goodwill ambassador, will help choose the final winner Sunday, April 27. The winner will be selected based on messaging, creativity and popularity. The more views the video submissions have, the more popular they become. Students, faculty and staff can help generate popularity by sharing the video on Facebook and Twitter with the hash tag #WED2014. The winners of The University of Toledo College of Business and Innovation’s fourth annual Business Innovation Competition were announced last week, with $17,500 in prize money being distributed to the winners. 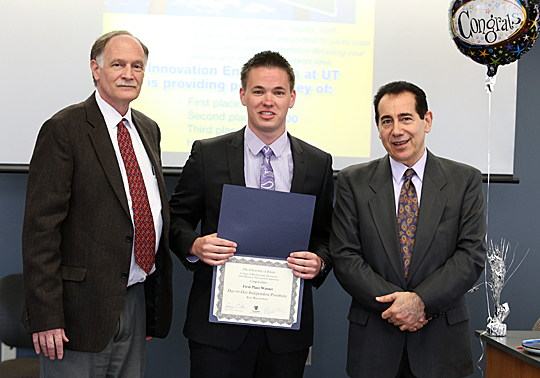 Kyle Wasserman took first place in this year’s Business Innovation Competition. Posing for a photo with him were Dr. Thomas Sharkey, left, and Dr. Sonny Ariss. “We congratulate all the participants from the entire University for the extremely high-quality proposals they submitted,” said Dr. Sonny Ariss, professor and chair of the UT Management Department. “These technologically innovative ideas clearly demonstrate creative thinking within the UT campus, which is exactly what this competition strives to foster. We are pleased to see this competition, now in its fourth year, continue to become a critical step in developing an innovation ecosystem that fosters the creation of legitimate new products and services for our society. First place, $10,000, Kyle Wasserman — Day-to-Day Independent Prosthetic, a device designed specifically to help double amputee victims with limited use of their hands to gain their independence back to perform normal day-to-day tasks. Second place, $5,000, Ted Otieno, An Nguyen and Dr. Mohammad Elahinia — Minimally Invasive Thrombectomy Device, a universal minimally invasive blood clot removal device. Third place, $2,000, Tom Burden and Bryan Heiser — Grypshon, a rubberized material used to keep mechanics’ tools from sliding off the aircraft. Honorable mention, $500, Kyle Wasserman, Shawn Kluck and Kyle Keiser — Whitetail Mowing LLC, an independent attachable string-trimming device that is mounted on a zero-turn mower. Wasserman, who will graduate from the College of Engineering in May, said his first-place winning product was his senior design project. He worked on the product with UT engineering students Derek Weickert, who graduates this May, and Daniel Romanko and Robert Castilleja, who graduated in December. Since Wasserman also claimed the top prize in the College of Business and Innovation’s third annual competition, he took the responsibility for the entry in this year’s contest. Yet Wasserman recognizes another level to the competition. Wasserman, along with Kyle Keiser, won the business plan competition last year for their Slide-Off Hangers, a unique hanger design that minimizes damage or stretching when removing shirts. He said he now has production capabilities and packaging for that item, is working on distribution channels, and expects it to be available in stores shortly. Entries for the fourth College of Business and Innovation business plan competition were due in February. Finalists made an oral presentation about their businesses to a panel of judges in April. Prize money was awarded to the newly formed business entity, not to the individuals. Since 1984, more than 200 students from The University of Toledo have spent an entire academic year studying at the University of Salford in northwest England near Manchester. 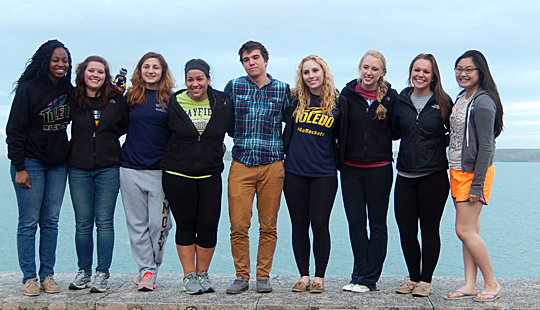 UT students studying at the University of Salford posed for a photo on the wall at the Dale Fort Field Center on the Irish Sea, Pembrokeshire Coast, Wales. They are, from left, Rose Henry, Rebekka Henck, Susan Salari, Maria Paulett, Nathan Wagner, Rebekah Skerl, Courtney Rusch, Tayler Fisher-Grabowsky and Ashley Teow. These students were part of the UT-Salford Exchange Program — an opportunity for students at both institutions to spend a year studying abroad in advanced science curriculum. Students who apply and meet the criteria then get to study abroad while paying tuition to their home institution. “This long-standing exchange program has enjoyed a rich history of student and faculty exchanges in the biological sciences and, to a lesser extent, students in chemistry and physics,” said Dr. Patricia Komuniecki, UT vice provost for graduate affairs and dean of the College of Graduate Studies, who directed the program for 20 years. For the 2013-14 academic year, eight biology/pre-med students and one biology student from UT are studying at the University of Salford. Fifteen Salford students in biochemistry, biology and physics are studying here at UT. “Many alums of this exchange program have become physicians in diverse specialties, and other alums are now professors, research scientists, veterinarians, dentists, nurses and other health-care specialists, as well as attorneys and business entrepreneurs,” Komuniecki said. This Saturday, April 26, program alumni are gathering to celebrate its 30th anniversary in Toledo. UT alumni will be joined by University of Salford alumni who studied at UT through the program, and some Salford exchange students who came back and earned doctorates in biology and chemistry from UT. “We are delighted to welcome back UT and Salford alums of this exchange program to celebrate the 30th anniversary of this special educational, cross-cultural learning experience,” Komuniecki said. The symposium is followed by a box lunch and a forum for program alumni to reflect on their experiences with the exchange program. At 4 p.m. there will be a reception for faculty, staff, students and guests in Libbey Hall, and at 6 p.m. there will be a banquet for alumni in Student Union Room 2592.